We build software solutions for critical business processing and reporting. Whether your needs are large or small we have the knowledge to provide a comprehensive solution with 24/7 support. We utilize Microsoft technologies for proven scalability and reliability. We deal with local design firms and NEVER outsource to offshore vendors. We are strong believers in keeping the work local and you can be sure your dollars stay here. Utiliziing the latest .NET 4.0 framework we create rich Graphical User Interfaces (GUI) for your web or windows forms based applications. Usablilty is the key to a successful interface and by working closely with you and your stakeholders we can create an applicaiton that is both feature rich and user friendly. We also understand that your web site/application may be in an older version of .NET or even legacy ASP. We have the knowledge and expertise to cover your needs. We have 13 years of experience in defining process models, determining workflow and deriving automated solutions for business processes. Business process automation is a key factor in keeping labor costs manageable while improving quality. From years of working in the public and private sectors, we understand how automation can reduce effort hours and increase accuracy. This equates into direct profit margin increases. 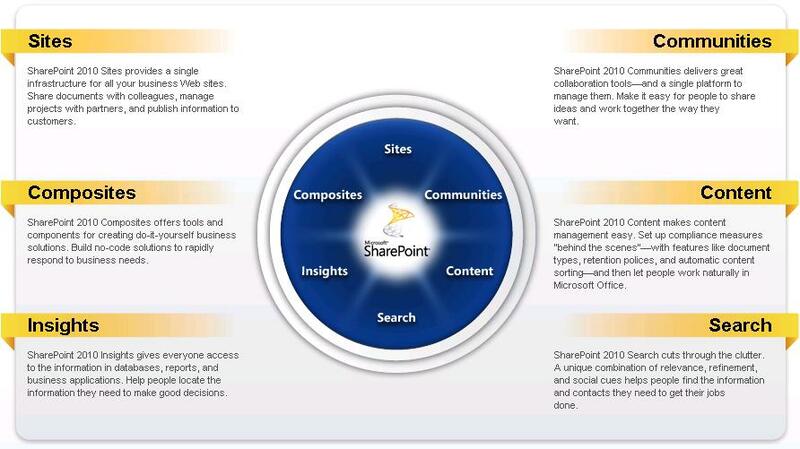 Using SharePoint 2010, we can set up Web sites to share information with others, manage documents from start to finish, and publish reports to help everyone make better decisions. Using this technology we have built a number of complete Extranet sites that feed data to secure backends for adminstrative functions, reporting and workflow management. Microsoft SQL Server is the database platform for those who want scalability, reliability and manageability. We have over 12 years of SQL knowledge and have spent countless hours learning how to optimize and management large systems of 1 terabyte and greater as well as small databases. Your web site is your presence in the eyes of the consumer or customer. Rescue Computers can build your site to be an extension of your business model and drive revenue to your company. We specialize in backend processes, analytics, reporting and performance. We have local partnerships with graphic design firms that specialize in professional design and presentation. We belive in simplicity in design, with easly readable text and minimal fluff. If your needs are a site with Flash and/or Silverlight, we can accommodate that as well. Do you need your site migrated to a new web hosting service? We can help you in all aspects of the project.